Funded by Cochrane’s Training Innovations Fund, Cochrane ClassMate is a trainer’s toolkit that will enable trainers and educators of evidence based healthcare to use Cochrane micro-tasks to support their course learning objectives. Intially focused on abstract screening and selection tasks, ClassMate will allow trainers to set tasks for their classes, choose the topics of interest, monitor progress and set up competitions and incentives, giving learners a fun practical experience while contributing real decisions to the Cochrane Register of Studies. 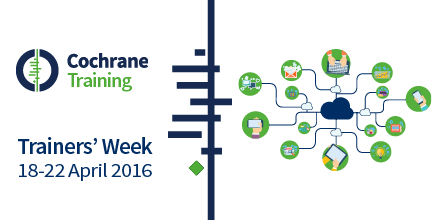 This webinar was part of Cochrane Trainers' Week 2016 and is an opportunity to learn more about how Cochrane ClassMate can help trainers in their training. The webinar also introduced the companion tool, Cochrane Crowd, which is the new Citizen Science platform offering a range of ‘micro’ tasks aimed at identifying and describing evidence. You can find out more about Cochrane Crowd by checking out an informative infographic here. The session was presented by Anna Noel-Storr, who is heading up the ClassMate and Cochrane Crowd projects. You can find out more about Anna's work on Cochrane and Crowdsourcing here. Anna was joined by colleagues from the project team, Gordon Dooley and Susi Wisniewski. Slides from the webinar are also available to download as a PDF below, and there is a link to Cochrane Crowd. Anyone interested in getting involved in the pilot project for Cochrane ClassMate can contact the team at classmate@cochrane.org or anna.noel-storr@rdm.ox.ac.uk.